When you head west on the Mohawk Trail out of Greenfield, you immediately notice a change as you enter Shelburne. The trail winds as you pass Hager’s Farm Market, a small farm store with local products, on your right and Shelburne Falls Coffee Roasters on your left. You won’t find corporate stores here, only small locally-owned businesses, some of which have been in the family for generations. Many of these long-time family-owned businesses are agricultural: sugar bushes, pick-your-own orchards, and dairy farms. Shelburne is located west of Greenfield and is bordered by Colrain to the north, Conway to the south, and Buckland to the west. The major through road is MA Route 2/The Mohawk Trail. The Village of Shelburne Falls, a small business and residential area, and deemed a Cultural District, includes parts of the towns of Buckland and Shelburne. Shelburne has ample opportunities to connect with nature, with a series of hiking trails on preserved land, such as at High Ledges. The Deerfield River borders the town to the South, offering fishing and boating. Shelburne shares with the Town of Buckland the Village of Shelburne Falls, a small residential area with a downtown that makes you feel like you have travelled back in time. Once a manufacturing and mill town, Shelburne Falls has stayed current with its thriving artist shops and galleries, individually-owned book stores, farm-to-table restaurants, and of course, the world famous Bridge of Flowers. On Friday afternoons in May to October, you can visit the Shelburne Falls Farmers Market on the green at Baptist Corner. The Bridge of Flowers is the only one of its kind in the world. Built in 1908 as a trolley bridge across the Deerfield River between the towns of Shelburne and Buckland, the 400-foot span was abandoned with the passing of the trolley line in 1928. The flower bridge became a reality in 1929 and there are over 500 varieties of annuals and perennials that are planted and tended by local volunteers and head gardener. This magical and famous historic landmark is the pride of Shelburne Falls. 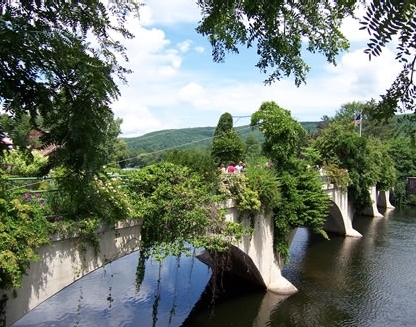 Every year on the Second Saturday in August, the Bridge of Flowers Road Race takes place in the village of Shelburne Falls, with a large part of the course running through Buckland. Over 1,000 runners come out to compete in one of the toughest races in New England, mainly due to the long stretch up Crittenden Hill. The following week, on the Third Sunday in August, is the Iron Bridge Dinner. 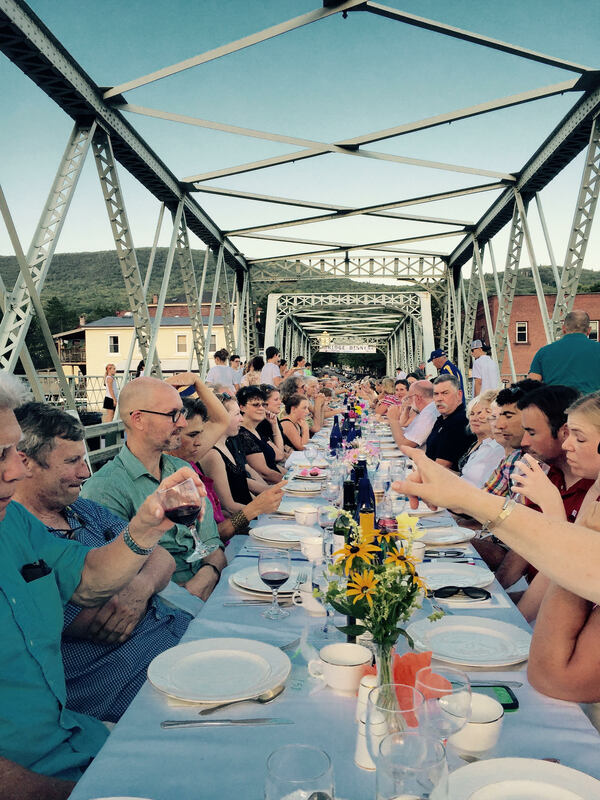 A long table is set across the 1890 Iron Bridge and 400 people sit down together for dinner to celebrate the partnership between the towns of Shelburne and Buckland. Shelburne Grange Fair happens on the fourth Saturday in August. This agricultural fair includes crafts, a flea market, entertainment, and a chicken barbecue. 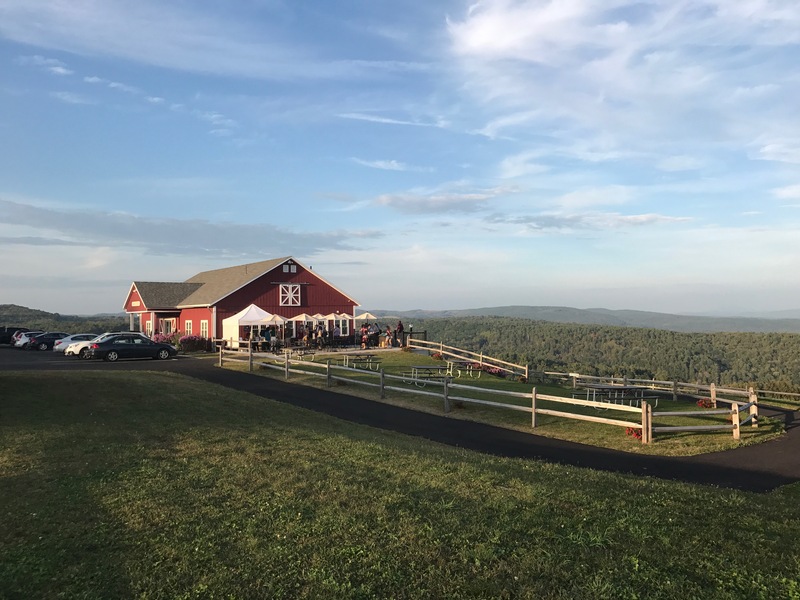 Apex Orchards in Shelburne is a pick-your-own apple orchard and farmstore, offering a tri-state view of Massachusetts, New Hampshire, and Vermont from its balcony. Kenburn Orchards also has spectacular mountain views and offers pick-your-own blueberries and choose-and-cut Christmas Trees. Shelburne also has several sugarhouses with seasonal restaurants, including Gould’s Sugar House. In downtown Shelburne Falls, Keystone Market is a family-owned grocery and convenience store, selling local products and ready-made foods from their deli. There are also many excellent options for dining out in Shelburne. Hearty Eats, a vegan and organic restaurant, serves gluten-free and healthy options without comprising taste. Mocha Maya's is a coffee shop by day, where locals come to work and read by day, and a music venue serving beer and wine by night. Baked, on Deerfield Ave, offers coffee, baked goods, breakfast, and lunch, in its cozy cafe by the Potholes. Shelburne has several artsy shops and galleries. The Shelburne Arts Cooperative is an artist-run store and gallery, with local and regional artists' works on display and a rotating exhibit. Wandering Moon, operating since 1994, sells handcrafted jewelry and crafts. Local woodworker, Tom Kuklinski, has a store and workshop on the Mohawk Trail, next to Kenburn Orchards. Kuklinski Woodworking sells handmade furniture and accessories using locally-sourced materials that are both beautiful works of art and functional pieces. Josh Simpson is a local glassblower who is well known beyond the town of Shelburne. He creates beautiful glass vases, tumblers, platters and more, but is most known for his planets. These round, glass globes are made to look like they have whole worlds inside them. His planets can be viewed and purchased at Salmon Falls Gallery.